A New York-based artist, started painting in a Russian art school in Siberia in 1991. She became a member of the Art Students League of NY in 2006, shortly after moving to the United States, and has been developing her style there ever since. In the past 4 years, Ekaterina has received numerous awards in juried shows by the The Salmagundi Club, Allied Artists of America, the Brooklyn Waterfront Artist Coalition, and other art organizations. 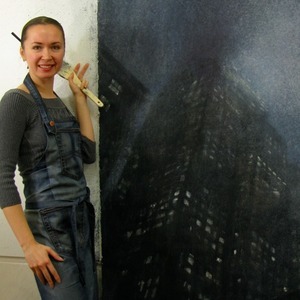 2012 is proving to be a very busy year for Ekaterina: she is preparing for a solo show in Russia (January, 2013), attending art residencies in Massachusetts, New York and Austria, and participating in dozens of group shows. Ekaterina's watercolors strive to break the medium's typical physical boundaries, overflowing onto 8 foot tall rolls of paper, and revealing new possibilities. She paints with large hardware brushes on rough textured paper, splashes, sprays, and wipes, washing away accuracy and exactness. In all of her explorations, Ekaterina seeks to move beyond established norms of the watercolor community.